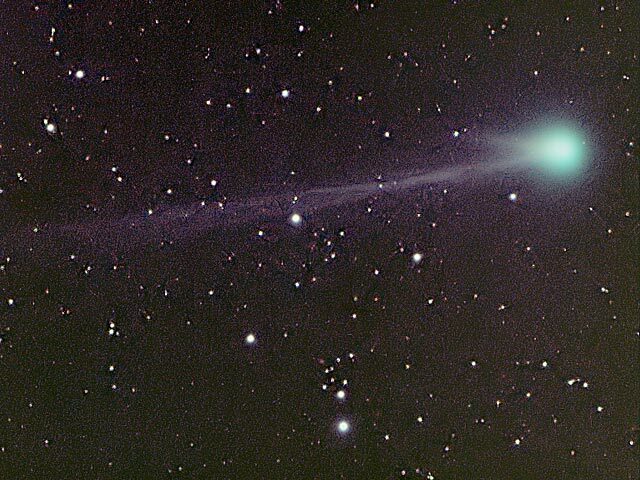 Explanation: A comet discovered last year has brightened unexpectedly and now may become visible to the unaided eye within the next month. Designated Comet C/2003 K4 (LINEAR), the comet was discovered in 2003 May by project LINEAR. Many reports already place the comet as brighter than magnitude 7, meaning that it can now be seen with binoculars. Reports also indicate the comet already has a visible tail nearly the length of a full Moon. Since predicting the future brightness of comets is a very tricky business, there remains the possibility that K4 might never become very bright. Current predictions, however, estimate the comet may approach fifth magnitude in October. K4 passes closest to the Sun on October 12 and then closest to the Earth on December 23. Comet K4 was photographed above from Van Buren, Arkansas, USA on August 17.